New York digital agency Code18 Interactive gives America's oldest apothecary, C.O. Bigelow, a website redesign that celebrates the legendary Greenwich Village pharmacy and its unique and unusual personal care remedies. The new site is fully responsive and built on the Magento 2 platform. NEW YORK - Jan. 10, 2019 - PRLog -- Code18 Interactive, a boutique digital agency based in New York City, announces the launch of a newly redesigned website for C.O. Bigelow Apothecaries (http://www.bigelowchemists.com). The highly customized and fully responsive Magento 2 website is a well-known ecommerce destination in the luxury beauty, skincare and personal health sector. "Shopping at C.O. Bigelow's retail store in New York City is a unique experience, and we wanted to reflect that authenticity in the online shopping experience," says Code18 Interactive's Creative Director Steve Pilon. "That's why it was so important for the site to embrace and express the company's rich history and heritage, while also offering customers a modern, user-friendly and engaging shopping experience." As the oldest apothecary in America, C.O. Bigelow produces their own world-famous line of products under the C.O. Bigelow brand. They also offer an artfully hand-picked selection of the best emerging brands and time-tested favorites in Beauty, Skin Care, Bath & Body, Hair Care, Fragrance, and more. "The C.O. Bigelow catalog is a treasure trove of thousands of the best and most effective beauty and skincare products from around the world," says Steve Pilon. "In an age where the web is full of cookie-cutter websites, Bigelow's distinct personality and flawless taste make them a standout above the rest." Among the 200+ brands that are showcased at C.O. Bigelow, you will find: Proraso, Marvis, Gülsha, GLAMGLOW, Jane Iredale, Deborah Lippman, Sol de Janeiro, Cannuka, Graffitti Collective, and more. The site also features a wide selection of popular natural and homeopathic remedies from companies such as Strepsils, Hylands, Badger Balm, Boiron, and Banale. Code18 Interactive is a New York Digital Agency that caters to national Consumer and Media brands. The agency specializes in the design and development of enterprise-level WordPress and Magento 2 websites. They have the pleasure of working with many wonderful brands, including: GoGo squeeZ, Boursin Cheese, Public Radio International, Grove Atlantic Publishing, and others. The C.O. 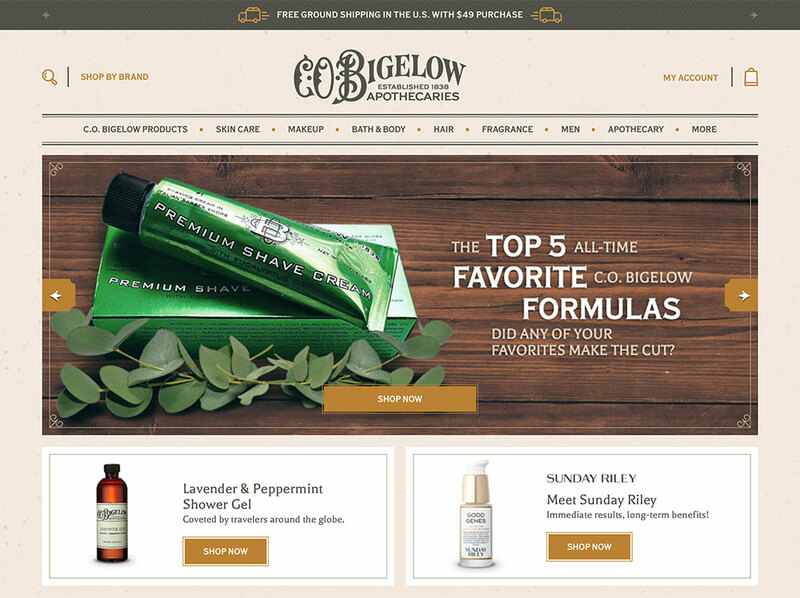 Bigelow ecommerce project was developed in partnership with Ecommerce Partners (http://ecommercepartners.net), an ecommerce agency also headquartered in New York.